Long before he became our most revered black nationalist figure, Malcolm X was a poet. Manning Marable's biography A Life of Reinvention: Malcolm X made me aware of the leader's interest in poetry. Marable explains that while in prison Malcolm became "a devoted letter writer." Among other topics concerning the written correspondences, Marable observes that Malcolm's "letters were also filled with lines of verse." 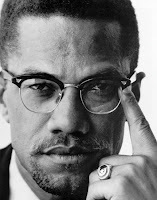 In one of the letters that Marable highlights, Malcolm wrote that "I'm a real bug for poetry. When you think back over all our past lives, only poetry could best wit into the vast emptiness created by men." The ideas that Malcolm was a "bug for poetry" and that his letters were "filled with lines of verse" are fascinating. What kinds of poems did Malcolm read and write, and why did the genre appeal to him? When we consider Malcolm's superb rhetorical skills, it makes sense that he would be fond of poetry and wordplay at that crucial stage in his development.